The A85 is a well-kent road – at one end the Highlands and at the other Perth. With Raymond being a Perthshire boy and me a Highland laddie, we have often found ourselves dashing North or South along the side of Loch Earn and remarking about how beautiful the area is. 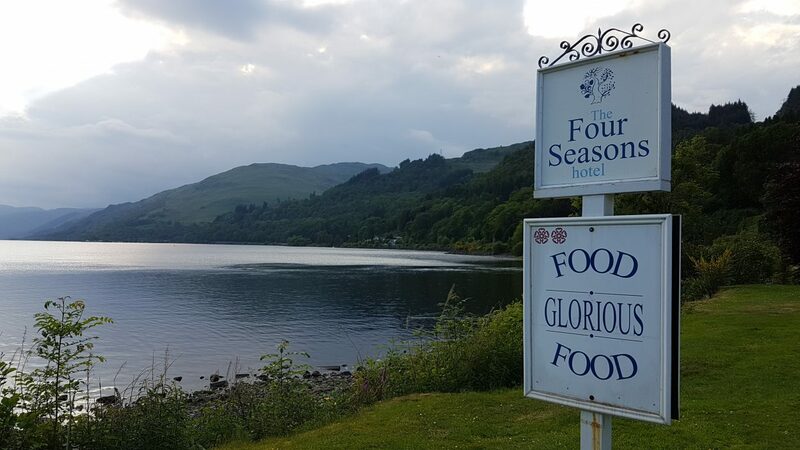 The Four Seasons Hotel sits right on the lochside looking towards Lochearnhead and is a well-known landmark along the route. Built in the early 1800s it was originally the home of the local lime kilns manager before becoming the village schoolmaster’s house. Converted in the 1900s, the house was extended into a small hotel, designed to make the most of the fabulous view. Susan Stuart with her enviable background in the hospitality industry purchased the hotel in July last year after a long search for the perfect hotel to call home. Susan was hosting one of her quarterly Food and Drink Pairing Menu Dinner’s and invited us along to experience dinner, bed and breakfast at the hotel. We decided to arrive early as we wanted to make the most of the fabulous blue sky and brilliant sunshine by exploring the trails around the village. Check in was warm and friendly and we were soon settled into our bedroom which enjoyed uninterrupted loch views. Our room also had a Bose stereo and full-sized Arran Aromatics toiletries in the bathroom. A plate of homemade shortbread, bottled water and a tea tray with almost every type of tea you could wish for welcomed us. 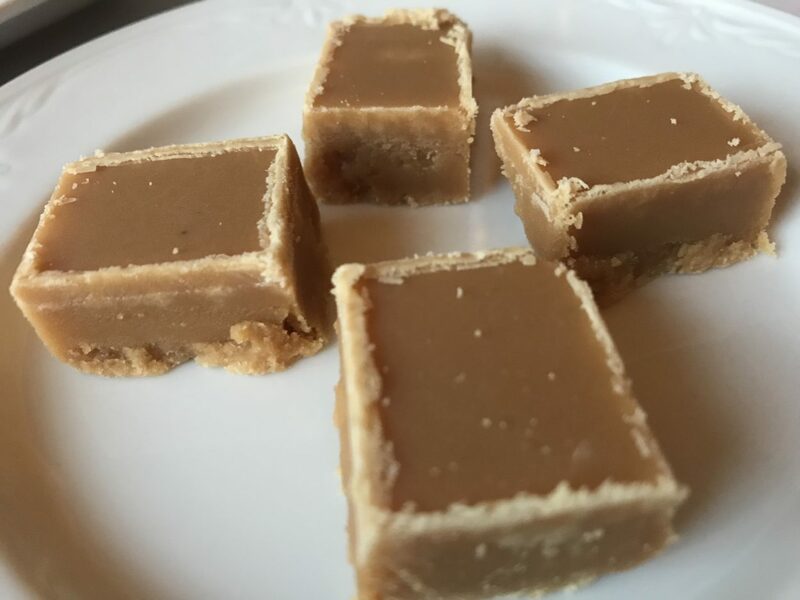 We made quick work of the shortbread – essential energy for our wanderings in this most northern part of Loch Lomond and the Trossachs National Park. 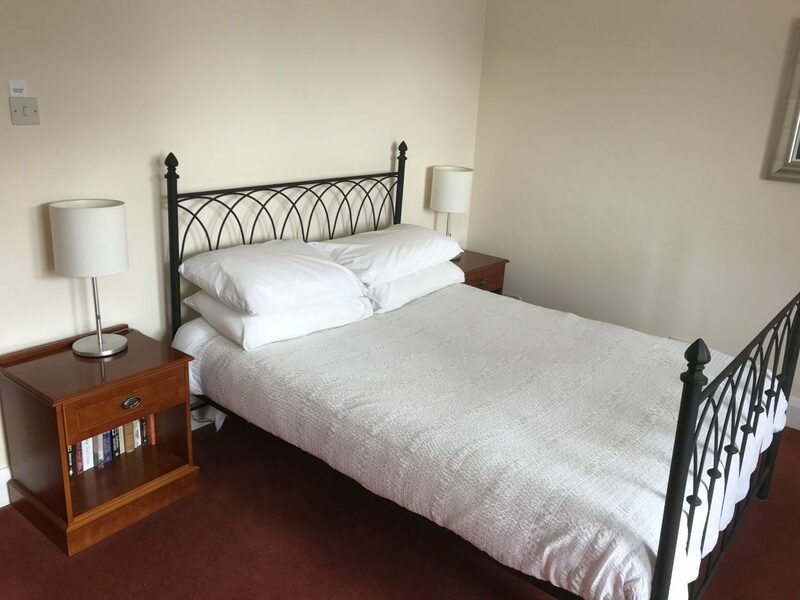 Room 10 – Our huge en-suite bedroom with stunning loch view. A window with a view – a common theme at The Four Seasons Hotel. We had a right drouth when we arrived and could have gone straight to the terrace but decided to head out to explore St Fillans. The room information folder has a list of local walks ranging in both difficulty and time. We decided to go on the easiest and most gentle so that we could relax on the terrace when we got back and enjoy the loch views before dinner. 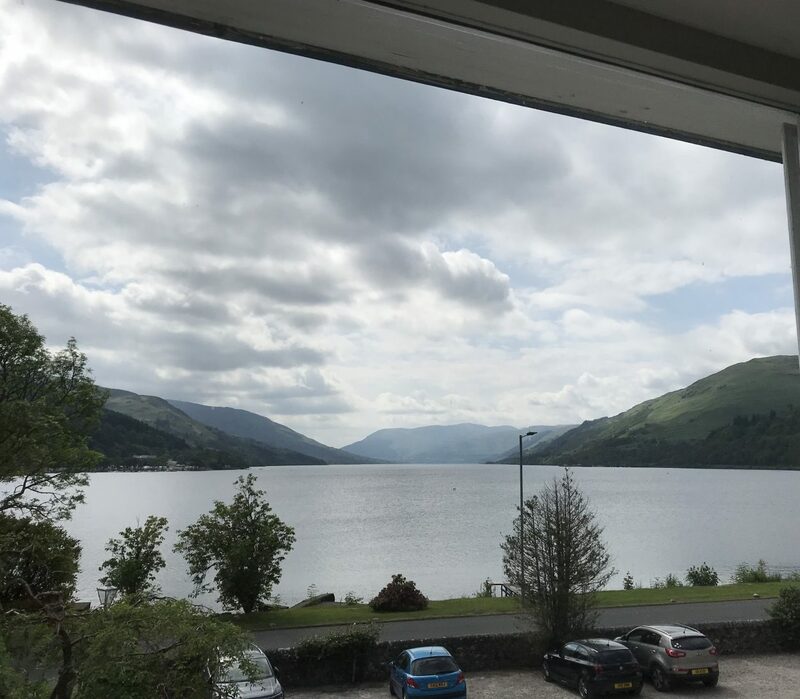 Activity in St Fillans centres around the loch where fishermen, campers, windsurfers and waterskiers all enjoy the fresh air and stunning landscapes. The informal Tarken cafe/bar serves coffee, tasty soups and sandwiches throughout the day plus bar meals in the evening. 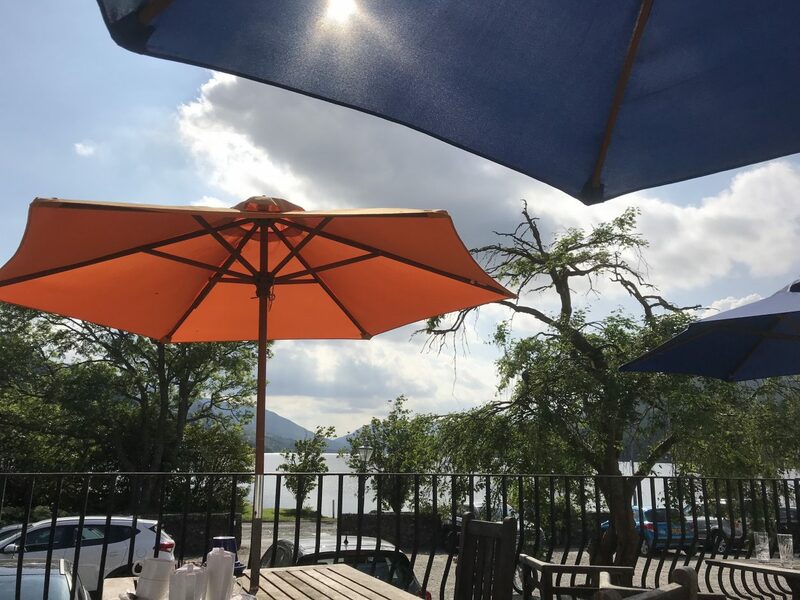 The drinks terrace decked with colourful brollies is the ideal place to sit and watch the watersports on the loch and enjoy the views. A couple of Inveralmond Brewery’s Ossian beers quenched our thirst while we chatted to other guests on the terrace. Interestingly they had been to the last food and wine dinner and loved it so much they had come back. This summer tasting menu sounded delicious so we couldn’t wait to experience it. Guests were to gather at 7 pm for Champagne and canapes with dinner starting at 7.30pm. 7 pm came and went. We like that! This is a place to relax, chill out and enjoy the big skies. Guests buzzed around down by the lochside taking photographs as the sun cast beautiful shafts of light across the loch. Four Belgian bikers on a tour of Scotland marvelled at the scenery before joining us for a Scottish feast. The Champagne was chilling, and we were all late – nobody worried! Inside, the dining room enjoys the same loch view but with the bonus of no midges. 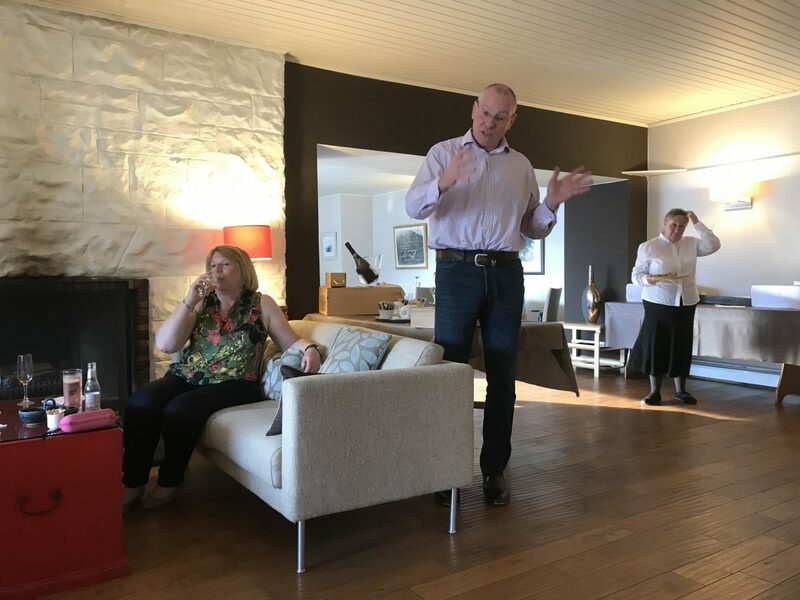 We gathered for an introduction to the evening from Richard of Great Grog over a glass of fizz and tasty nibbles, how civilised. 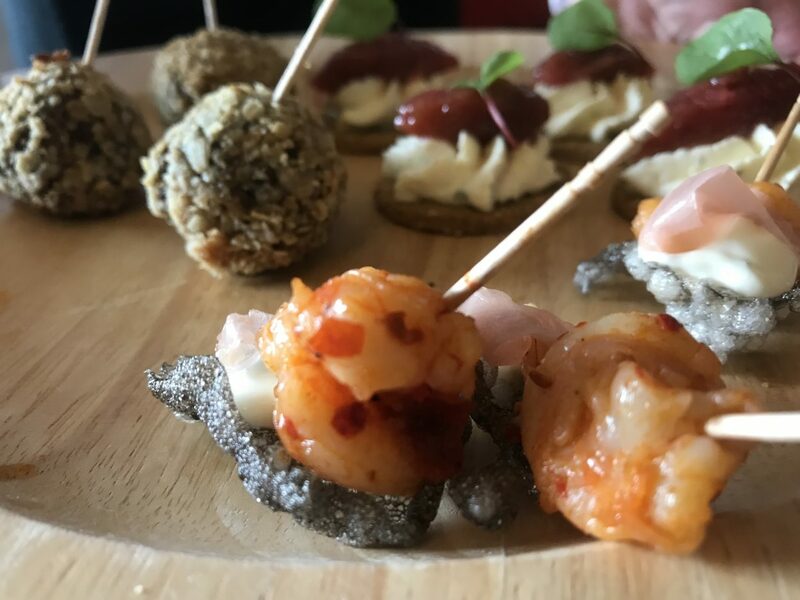 The evening kicked off with Seasonal Canapes of harissa prawn skewers on tapioca squid ink tuile; haggis bonbons served with café au lait and oatcakes topped with smoked salmon, wasabi crème Fraiche and pickled ginger. These tasty bites were all served with Gobillard Blanc De Noirs NV. Chardonnay, Pinot Noir and Pinot Meunier grapes are usually used to make champers but interestingly this one has no Chardonnay included. The result of using only the flesh of the black grapes was a full-bodied, fruity Champagne (that’s clear in colour!). The haggis balls were extremely moreish, and our lovely waitress kept us topped up! Our next course of smoked seafood looked like a work of art on its white canvas. 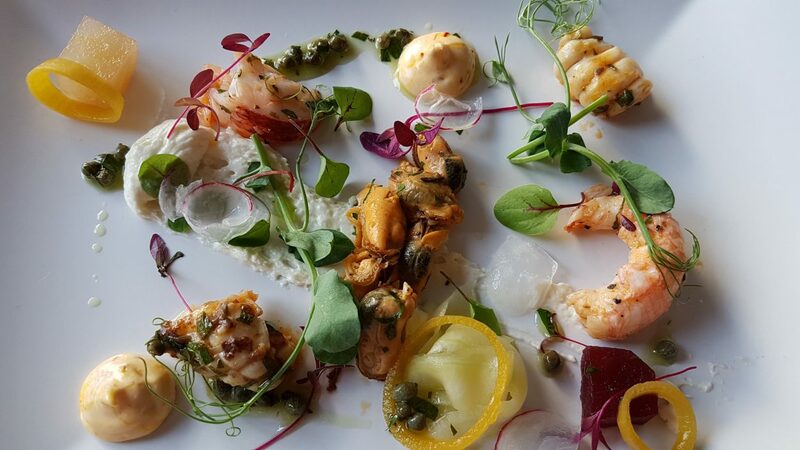 A selection of langoustine tail, lobster, mussel and squid were enhanced with a creamy saffron rouille, slightly tart pickled shallots, heritage radish and a light caper dressing. Handmade Chenin Blanc 2017 from Stellenbosch was its chosen partner. The wine name gives the game away here, but the vineyard hand pick and sort all the grapes from one-hundred-year-old vines. Older vines result in less fruit, but the wee drop they produce is all the more delicious as the nutrients are shared between fewer grapes. Unoaked, this fruity citrusy wine was extremely drinkable and didn’t overpower the delicately smoked shellfish one bit. 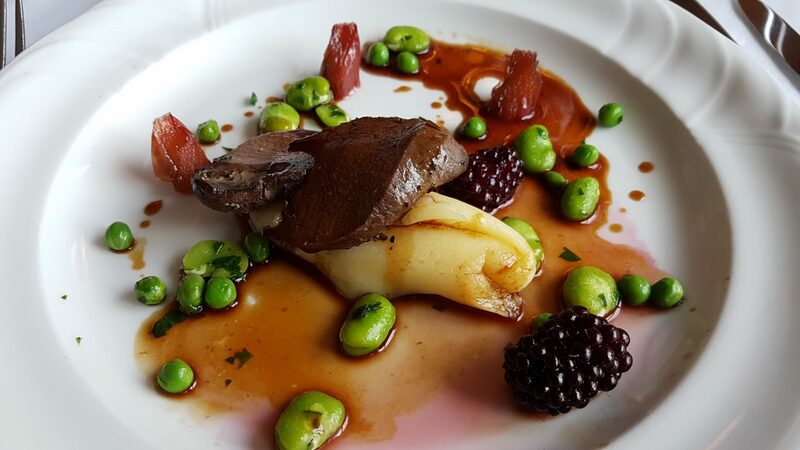 Next up was seared breast of wood pigeon served on a bed of vanilla pomme puree (mashed tatties) primavera of peas and beans, rhubarb and finished with a couple of huge brambles and some jus. Catherine Marshall Pinot Noir Sandstone Soil 2017 was the companion to this course. From the cooler climate of Elgin in South Africa, the wine was elegant, balanced and rich in berry flavours. Fermenting in large ceramic eggs allows the liquid good movement during the process and this helps to maximise flavours and extract tannins. 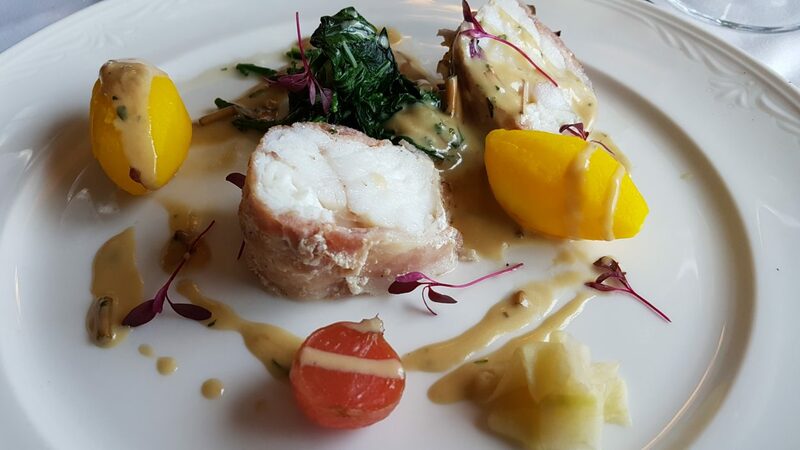 Meaty monkfish tail wrapped in streaky Ayrshire bacon was next. This was served with saffron potatoes, radish barigoule, wilted chard, pickled cucumber ribbons and a lemongrass veloute. A Demorgenzon Chardonnay 2016 was chosen by Richard to compliment the fish. Barrel fermented, it’s flavours of grapefruit, apricot, white peach and vanilla didn’t overpower the monkfish but were also big and robust enough to cope with the meaty bacon flavours. 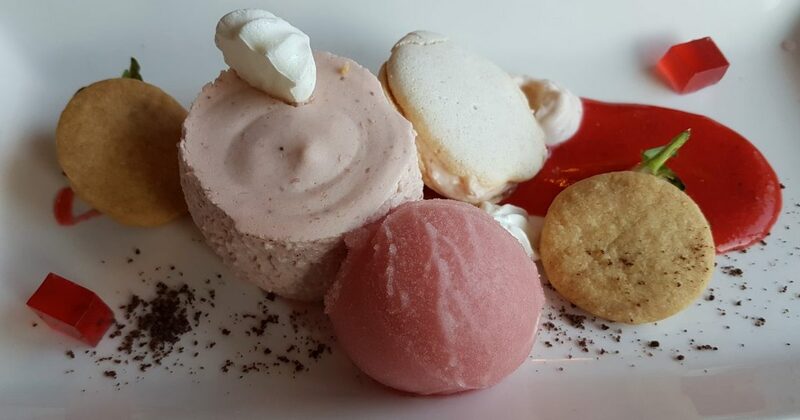 Soft fruit season is in full swing in Scotland so it was no surprise that dessert was a deliciously light strawberry bavarois. This was served with a lemon sable biscuit, cubes of tayberry jelly and dreamy strawberries and cream macaron. The star of the show though was the Cairn O’ Mhor sparkling sorbet – addictive! This course was matched with a Fernando Classic Oloroso which felt too heavy for this dreamy dessert. A glass of perfectly chilled Cairn o Mhor Strawberry fizz or alternative sweet wine would have worked better. We decided to keep our sherry for the next course – cheese!!! 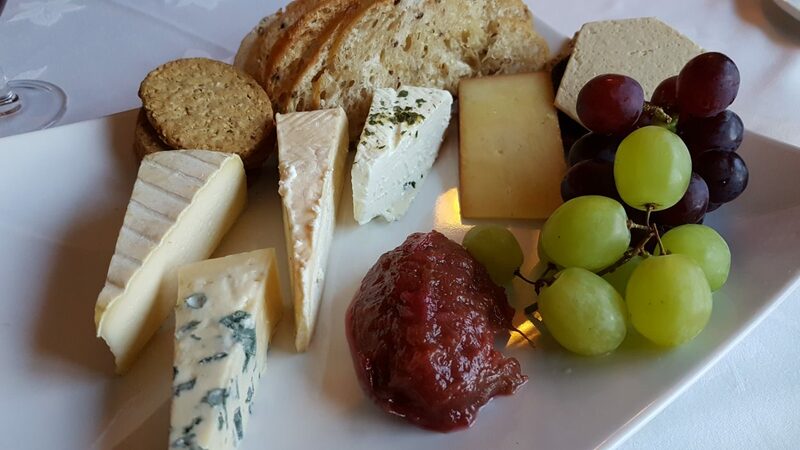 To finish, we enjoyed a Strathearn Cheese Company Slate which included their Lady Mary, Wee Comrie and Strathearn cheese. Sourdough crisps, oatcakes, crackers and grapes filled the plate along with a generous spoonful of Gooseberry Chutney. Strathearn’s signature cheese of the same name is washed with a Glenturret ten-year-old single malt brine flavoured concoction and makes this cheese very special. Strathearn Cheese also embrace Perthshire when making their Lady Mary cheese by using wild foraged garlic and our favourite, Summer Harvest truffle infused rapeseed oil, in the cheese making process. With all these rich buttery flavours the Oloroso’s dry nut and orange flavours contrasted perfectly. Cafetiere coffee and homemade tablet concluded the meal and were the perfect sweet treat before bed. The tablet also passed the tablet makers test – high praise indeed! It was around 10.30 pm when we finished our dinner and still lovely and bright outside so we decided to take a wander up the opposite side of the loch to work off the tablet. It was a beautiful evening with campfires dotted along the responsible camping sites on the lochside while campers fished the loch for tomorrow’s tea. 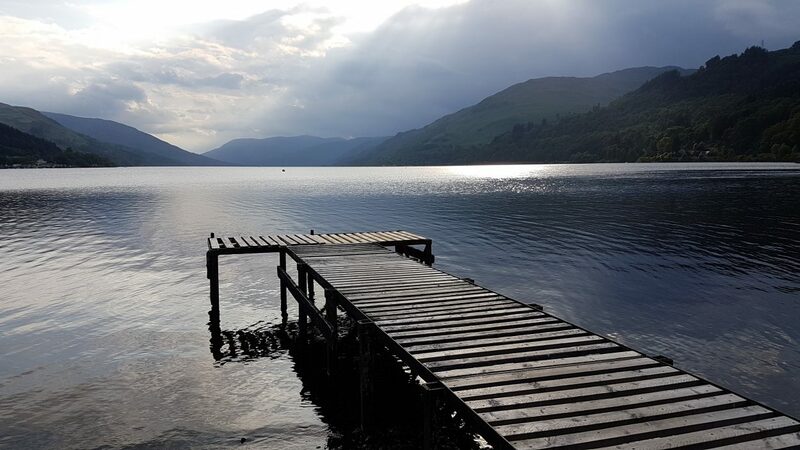 It was such a peaceful scene apart from the midges – they were out in full force! After a really peaceful nights’ sleep, we woke to another beautiful sunny day in St Fillans. The loch shimmered in the morning sun and guests packing up their cars took one last photograph of the view. Breakfast is served in the same room as dinner. 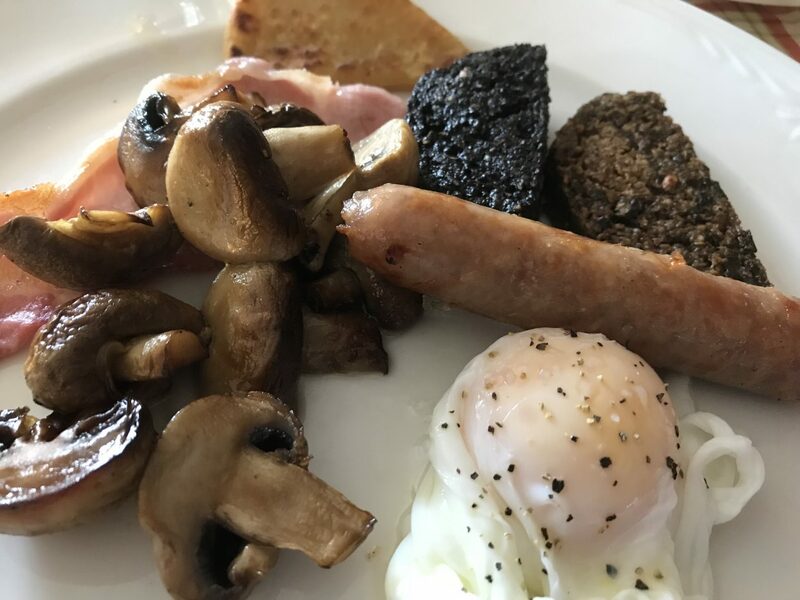 A selection of fresh fruits, cereals, fruit juices, bread and pastries are laid out for self-service while the full Scottish is freshly prepared and served from the kitchen. The Fours Seasons Hotel Food and Wine Pairing dinners take place each quarter with the autumn tasting on 20th September and winter one on 7th December. 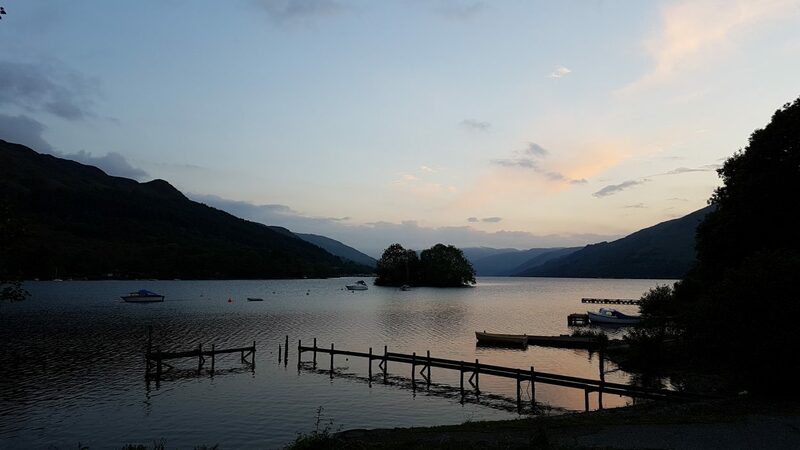 Places are limited, so if you want to go along to enjoy amazing views, great food and drink in a relaxed and friendly environment we recommend booking early, as they do sell out. While these events are special, Carlos the chef and his team serve up 2 AA rosette quality food every day so don’t feel restricted to these dates. 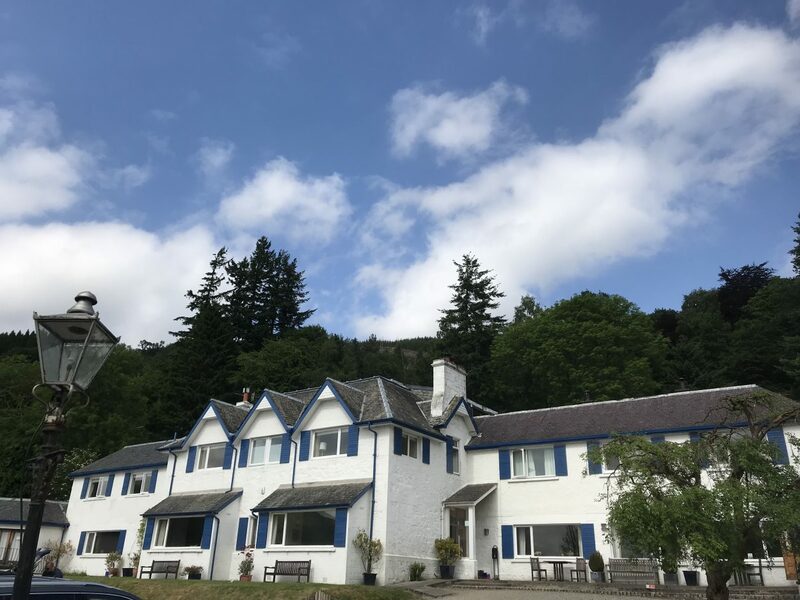 St Fillans and The Four Seasons Hotel is the perfect place to relax and chill out and is less than 70 miles from Edinburgh, Glasgow, Stirling, Oban, Perth, Fort William and St Andrews. Susan has got some great plans for the hotel so we can’t wait to go back in the future to see all the changes. PS. Four-legged friends are also very welcome here and the hotel has a selection of pet-friendly bedrooms. The hotel can operate a listening service to make sure your pet is happy whilst you are at dinner and if you forget their food, there’s also a dog and cat food menu available! 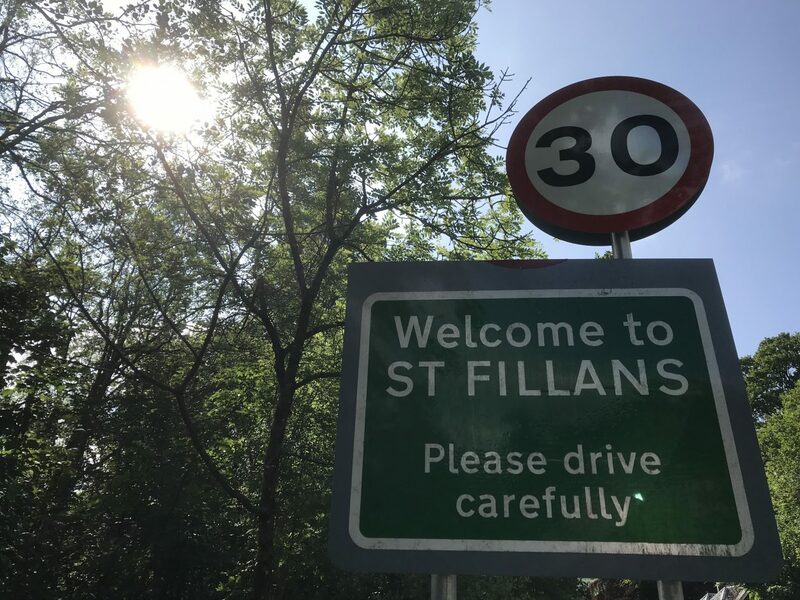 Hopefully, you have enjoyed reading about our visit to St Fillans. You can follow our travels by signing up for our updates here. Thank you to Susan and the team for inviting us to their Spring Food and Drink Pairing Dinner and for looking after us so well. Aww, thanks! 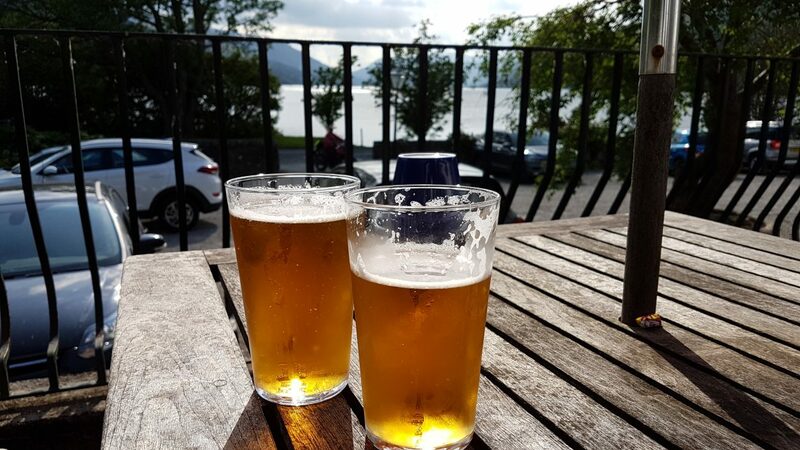 Wishing we were sitting on the terrace again tonight in this beautiful sunshine enjoying the view….and a pint!